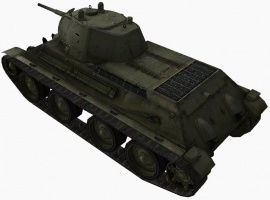 The A-20 is a Soviet tier 4 light tank. Development of the A-20 tank started at Kharkov Factory No. 138 in December 1937. 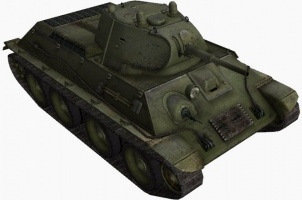 The project was a further development of the BT-7 tank and became a predecessor of the legendary T-34. Work on the vehicle was led by Mikhail Koshkin. On May 18, 1938, technical characteristics of the tank designated BT-20 were approved. Only a few experimental prototypes, with a wheeled caterpillar suspension, were built for training purposes. The A-20 is a very fast tank with a high top speed, but suffers from poor maneuverability at high speed. 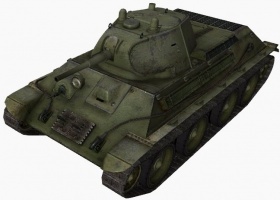 It's considered one of the most agile tanks in the game in terms of speed. However, when high agility comes, with paper armor. It is sloped and there will be a chance to block some small arms shots, but it's useless when facing more armed opponents. The A-20 leads to the T-34, and the T-50. Somewhat large for a light tank. This isn't to say that the A-20 doesn't have its share of issues. The A-20's mobility statistics are a lie, for one. It has a tendency to bleed an incredible amount of speed on turns, and its acceleration and maneuverability are nowhere near as good as other lights. Active scouting (running about and dashing from cover to cover, spotting enemy tanks for your team) is very dangerous, and requires a lot of skill and forethought. However, the turning radius and speed are surprisingly tight, much like the BT-7. The A-20's view range is disappointingly bad for passive scouting as well. While the Pz.Kpfw. 38 (t) n.A. at least has an excellent 370 m view range, the A-20 only has a view range of 330 m. Despite the A-20's camouflage bonuses as a light tank, significant investment in the Camouflage skill and Recon skill is required in order to negate this weakness. Mounting equipment like Coated Optics will also help in passive scouting. Firepower-wise, the A-20 doesn't really have much to complain about. The stock gun, the 45 mm 20K, and the 37 mm ZiS-19, which were previously used on the Tier 2 BT-2 and Tier 3 BT-7, are excellent and mediocre on those tanks, respectively. At Tier 4, they are completely useless, and should be gotten rid of as quickly as possible. There are three viable weapons. The 37 mm Automatic SH-37 is, as the name suggests, a magazine-fed autocannon. It is good enough to kill lightly armoured artillery and tank destroyers and light tanks, but little else. The 45 mm VT-42 offers good accuracy, rate-of-fire, and aim time, as well as fairly good penetration (for Tier 4) in exchange for low alpha damage, making it an ideal sniper weapon. The 76 mm L-11 is the complete opposite, with terrible accuracy and aim time, low rate-of-fire, but good alpha damage. It works better at close ranges. Against Tier 4, 5, and even 6 tanks, the A-20 can still do some damage. 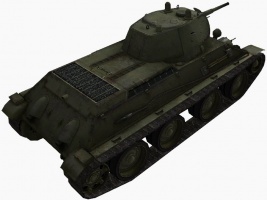 Unsurprisingly, since it is a light tank, the A-20 has no armor to speak of, and despite the good sloping, it should never rely on its armor to save it from enemy fire (Although the armor is enough to bounce a few small arms fire). This page has been accessed 315,947 times.